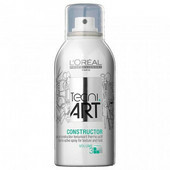 An anti-humidity, anti-frizz protection spray which acts like a real anti-static barrier for unique and long-lasting anti-frizz protection, even in extreme climatic conditions. The Ionic Neutralizing System provides anti-static protection and 24-hr anti-frizz action. Ensures enhanced shine through quick dry action without residue, and added UV filter. Now available in a compressed hairspray format for an improved intensive professional use: volume 2X smaller, lasts as long, same performance.